Celebrate Christmas in this magical story especially created for your young reader. 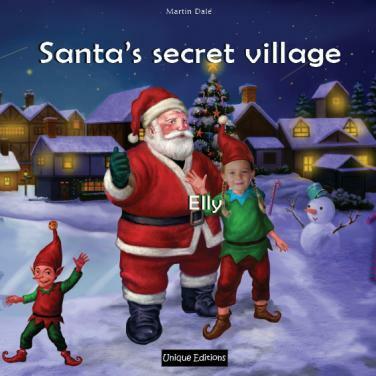 Your child will join a friendly elf and go on the most amazing adventure to a secret village. Celebrate Christmas in this magical story especially created for your young reader. Your child will join a friendly elf and go on the most amazing adventure to a secret village, where Santa’s plans for Christmas day aren’t going as smoothly as usual. Your child becomes Father Christmas’ personal hero, making sure that all the kids in the world receive their gifts on time for the big day. Illustrated with delightful, vivid acrylics, a winter wonderland comes to life. Personalisation : The photo of the child appears 18 times and the name 34 times. Your personalised message to the child appears at the beginning of the book. Book description : 36 page personalised photo storybook, size 20 cm x 20 cm, thick high quality paper, professional digital printing and a durable cover. Christmas magic livens up your child’s inner world as she gets to know the sounds of words and rhymes. The perfect invitation to personalised story book reading. Of course, words and photographs achieve little without charming illustration and here, children are far from naïve. The appeal of gorgeous art doesn't go unnoticed by young readers, who are fussy about their preferences. This is why Unique Editions focuses on being as picky about our personalised book illustrators as our readers are. Santa’s Secret Village is beautifully crafted and brightly shaded in mixed media. The magic of water colours is mixed with vivid media to achieve the sparkling lighting effects that no personalised christmas story book should be without. Christmas only comes to town once a year but Santa’s Secret Village lets children dig into their imaginations all year round. Einstein said, "The gift of fantasy has meant more to me than any talent for abstract, positive thinking." Unique Editions, once again, brings the gift of fantasy to every home, as we have been doing for years. Unique Editions has a range of unique personalised christmas gifts. So make your own book this Christmas, and let your child live out all his fantasies.